As described before system containing model surfactants and water do self-assemble into bilayers. Similar real bilayer, such as the cell membrane, are in fluid state. That is that there molecule exhibit rapid diffusion in the lateral direction. 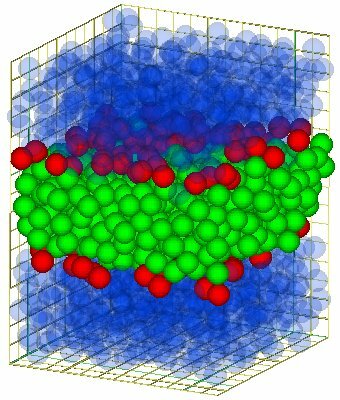 For the model bilayer this has been proven by measuring the mean square displacement of each molecule (either water and surfactant) as it develops in time. It turns out that the mean square displacement grows linearly with time. Hence the motions of the molecules is diffusive. However, the motion the surfactants is a lot slower than the motion of the water particles, as expected. If one splits the motion into a lateral and a normal component (with respect to the bilayer plane) on find that the motion of the surfactant is almost totally determined by the lateral component. This is due to the fact that the surfactants are constrained to the bilayer. But even for the water the lateral component dominates, because of the bilayer which acts as a barrier against the normal motion of the water particles. A more detailed study of the normal or transbilayer diffusion can be found elsewhere. For more details, see [1,2].